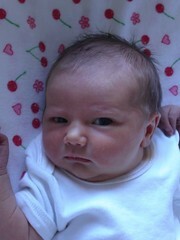 We’re having a hiatus here from posting – just a bit busy with baby COCO arriving last weekend. I thought I’d share a couple of handmade gifts with you. 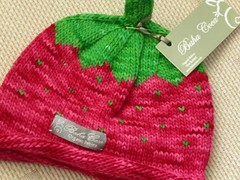 Firstly, the stunning *strawberry hat *given by a kiwi friend of mine and made by his friend. 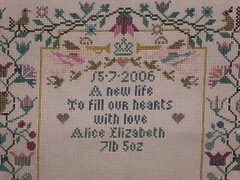 And the beautiful birth sampler made by my sister in law. I won’t be posting much for a while. The heatwave in London is enough to put anyone off knitting! Am still working on the alphabet blanket and it will be autumn before I pick up Mystical Stripe. Have a wonderful summer.